Publishing pictures on social media is a great way for small businesses to build up engagement. This sort of marketing is easy to set-up and maintain and go far to build brand loyalty. As the marketing head of a small business, pictures can spread your company’s marketing quickly and efficiently. These pictures need to be edited before they go to social media though. This editing will tailor the images for maximum effect. Badly edited pictures may even hurt your company’s message. Here is how to edit photos for social media engagement. It is important to make sure each photo is cropped professionally to the social media platform it is on. Each platform presents photos in a different size. If your photos are improperly cropped or sized, they will be unintelligible. This will rob the photos of any meaning. If you’re at all familiar with advertising campaigns, you’re aware of how crucial it is to be clear in your marketing techniques. Some editing apps will study your photos and crop them automatically for certain platforms. However, much of this cropping will have to be done with the human eye to ensure that the photo’s impact remains. This sizing is the basic editing that all photos will have to go through. As you edit, make sure that your branding is always present. Many photos will add graphics, drawing, and other material as they are edited. It is important that these add-ons have your company’s logo and color scheme. This creates a sense of uniformity that is very useful when these photos are shared with others on the platform. On a social media platform, these photos may go a long way from your space before a potential customer sees it. They need to have all the branding to lead the customer back. You should use editing filters on your photos to give them a professional look. In particular, you can use these filters to give all your photos a mutual color scheme. This will link them and make them look like a single set. These filters can also sharpen your photos and make them look more dynamic. If you want get really detailed, you ran retouch people, objects or backgrounds using the RetouchMe website. To get the best effect, you should use professional filters and rely on more subtle styles. These filters will let you get a more professional look without a huge investment. A great tool to help edit photo is visual attention software, or VAS. VAS will analyze your photo and determine where the viewers eyes will be drawn to in the first few seconds. VAS can even tell you the path the viewers eyes will follow. This can be useful when designing graphics on the image. It can also ensure the viewer will focus on the information you want them to focus on. Look toward other software options such as viral marketing software to improve your marketing techniques. 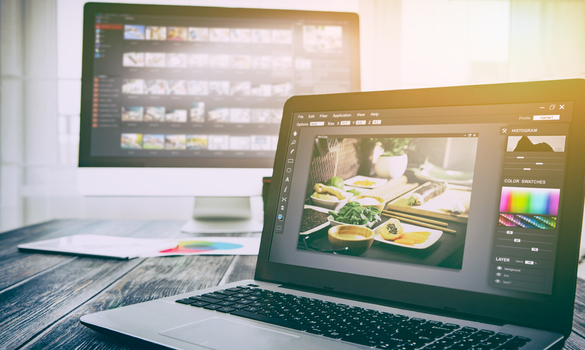 VAS is a state-of-the-art tool can help optimize your photos on any platform. While editing is always needed for photos, do not get carried away and over edit the image. Over edited images will stand out on social media platforms. The viewers will mock them and think your company is trying too hard. In particular, extreme filters will make your photos look comic, rather then impressive. Too many graphics will make the photo look like an ad, and it will not be shared. On social media a little editing looks professional, too much looks amateurish. Photos can be edited to improve your social media engagement in a variety of ways. You should make sure each photo is cropped correctly for the platform. All graphics should show brand consistency in symbols and colors. You can use filters to make your photos look uniform and professional. VAS can help you optimize your photos for viewers. Do not overedit your photos so they look fake. Keeping these tips in mind will ensure followers will flock to your social media sites.